Machine learning (ML) is the fastest growing field in computer science, and Health Informatics (HI) is amongst the greatest application challenges, providing future benefits in improved medical diagnoses, disease analyses, and pharmaceutical development. However, successful ML for HI needs a concerted effort, fostering integrative research between experts ranging from diverse disciplines from data science to visualization. Tackling complex challenges needs both disciplinary excellence and cross-disciplinary networking without any boundaries. Following the HCI-KDD approach, in combining the best of two worlds, it is aimed to support human intelligence with machine intelligence. 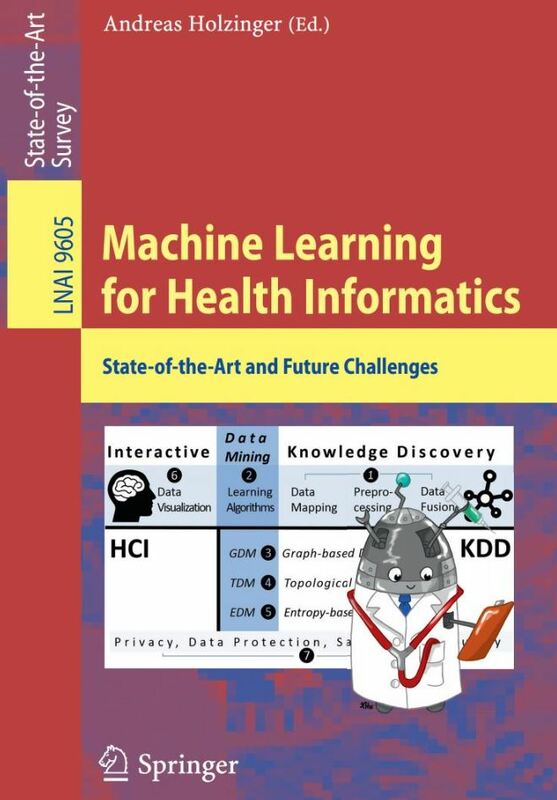 This state-of-the-art survey is an output of the international HCI-KDD expert network and features 22 carefully selected and peer-reviewed chapters on hot topics in machine learning for health informatics; they discuss open problems and future challenges in order to stimulate further research and international progress in this field. Machine learning (ML) is the fastest growing field in computer science [Jordan, M. I. & Mitchell, T. M. 2015. Machine learning: Trends, perspectives, and prospects. Science, 349, (6245), 255-260], and it is well accepted that “health” is amongst the greatest application challenges. Successful research in ML needs a concerted effort, fostering integrative research between experts ranging from diverse disciplines such as data science to visual analytics. Tackling complex research undertakings needs both disciplinary excellence and cross-disciplinary networking without boundaries, following the HCI-KDD approach in combining the best of two worlds. Health systems worldwide are challenged by big data and increasing amounts of unstructured information. Biomedicine and the Life Sciences are increasingly turning into a big data intensive science. However, sometimes the problem is not big data but complex data: heterogeneous, high-dimensional, probabilistic, incomplete, uncertain and noisy data. The effective and efficient use of ML-algorithms for solving complex problems in health informatcis are a commandment of our time and may support evidence-based decision-making and help eventually to realize the grand goals of personalized medicine: in modelling the complexity of patients to tailor medical decisions, health practices and therapies to the individual patient. This Volume of LNCS State-of-the-Art provides an overview of the 7 areas – see image above – with the goal of realizing integrated, interactive machine learning at the clinical and scientific workplace of biomedcine and health. This needs a concerted effort in bringing together experts with diverse backgrounds, complementary competencies, but common interests and a shared central vision: to make sense of big data by using machine learning and putting the “doctor-in-the-loop”. Papers are sought from the 7 topical areas (image above) but always with the big picture in mind and justifying how your view may contribute to an overall solution. Each paper shall have a special structure (see below). Papers which deal with fundamental research questions and theoretical aspects in machine learning are very welcome. Quality needs time – and we want to ensure the highest possible quality, to provide a clear benefit to our potential readers – so there is no fixed deadline, however, the Volume is now in production and expected to appear in October 2016. After invitation for submission prepare your paper following the Springer llncs2e style (llncs.cls, splncs.bst). There is no definite page limit – but the ususal chapters are between 10 and 20 pages. However, in any case, please produce even pages to ensure smooth page breaks, e.g. 10, 12, 14, 16, 18, 20 pages. NOTE: This State-of-the-art volume shall bring exclusive benefits for the readers and shall be of archival value on the desks and benches of both scientists, industrial practictioners, teachers and students (it is not necessary to produce rocket-science papers or Nobel-prize papers, which only a few people on this planet understand). Moreover, it shall be useful for fostering joint projects at national, European, and international level. Your paper will be assigned to two to three reviewers, so that you will receive valuable, useful feedback on how to further improve your paper. You will get notified in due course to prepare the final version. using this REVIEW-TEMPLATE-XXXX (word doc, 140kB). Thank you for your kind interest! Health systems worldwide are challenged by big and complex sets of heterogeneous, high-dimensional, complex data and increasing amounts of unstructured information. Due to the fact that biomedicine, health and the life sciences are turning into a data intensive science, machine learning can help to more evidence-based decision-making and support to realize the grand goals of personalized medicine [Holzinger, A. 2014. Trends in Interactive Knowledge Discovery for Personalized Medicine: Cognitive Science meets Machine Learning. IEEE Intelligent Informatics Bulletin, 15, (1), 6-14]. A grand goal of future medicine is in modelling the complexity of patients to tailor medical decisions, health practices and therapies to the individual patient. This trend towards personalized medicine produces unprecedented amounts of data, and even though the fact that human experts are excellent at pattern recognition in dimensions of smaller than three, the problem is that most biomedical data is in arbitrarily high dimensions – much higher than three. This makes manual analysis difficult, yet often practically impossible. Consequently, experts in daily biomedical routine are decreasingly capable of dealing with the complexity of such data. Moreover, they are – understandably – not interested in struggling around with the complexity of their data sets. Rather, the experts need insight into the data, so to gain knowledge in order to support their direct workflows and to find answers to their questions and hypotheses. 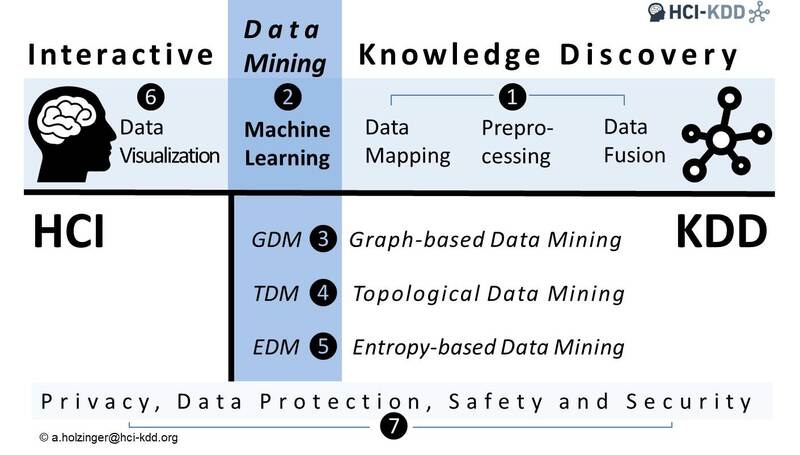 Therefore, it is necessary to provide efficient, useable and useful computational methods, algorithms and tools to discover knowledge and to interactively make sense of such high-dimensional data. The classic goal of machine learning is to develop algorithms which can learn and improve over time and can be used for predictions. In automatic machine learning (aML) great advances have been made, for example, in speech recognition, recommender systems, or autonomous vehicles (“Google Car”). Such automatic approaches greatly benefit from big data with many training sets available. However, in the health domain, particualarly in the clinical domain, sometimes we are confronted with a small number of data sets or even rare events, where aML-approaches suffer of insufficient training sets. Here, interactive machine learning (iML) may be of help. However, the term iML is not yet well used, so we define it as “algorithms that can interact with agents and can optimize their learning behavior through these interactions, where the agents can also be human.” This “human-in-the-loop” can be beneficial in solving computationally hard problems. Relevant examples include subspace clustering, protein folding, or k-anonymization of health data. In such problems the human expertise may help to reduce an exponential search space through heuristic selection of samples. Therefore, what would otherwise be an NP-hard problem, reduces greatly in complexity through the input and the assistance of a human agent involved in the learning phase. © 2016 by hci-kdd.org. All rights reserved.